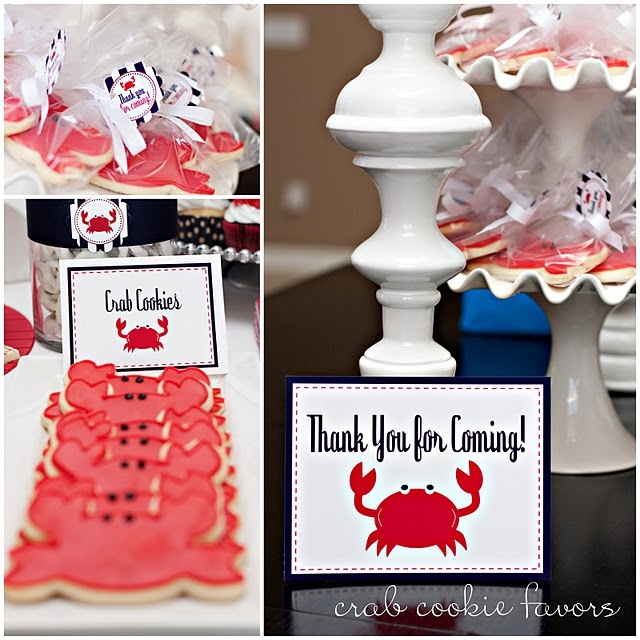 Kim from The TomKat Studio has completely blown me away with her amazing talent and skill on her son Tommy's Crab Shack-themed Birthday Party. I had to pick my jaw up off the floor after looking through all the incredible photos of her party (taken by the talented Vicki Lynn)--I was so inpsired, so totally blown away. The overall look: spectacular, striking, stunning. 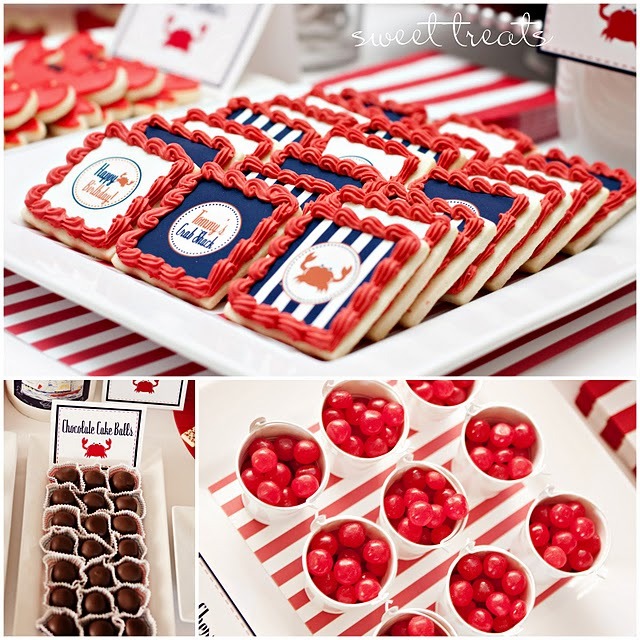 Kim is an inspiration herself, in terms of a talented graphic designer who provides some of the cutest party imprintables for hundreds--no, make that thousands. She's also a mom of two beautiful children, a lovely wife to her husband, and did I forget to mention she is a correspondent for Home Goods (yes, the Home Goods) and Project Nursery? Oh, and that her darling products were just featured in the July issue of InStyle magazine in Amy Atlas' ice cream feature (Amy, by the way, who is a tremendous inspiration to me, is also one to Kim, and Kim is so forthcoming and acknowledges all who inspired her for this party). Yes, I see this as the start of many, many great things to come for Kim. She has two lovely new team members for The TomKat Studio (Andrea and Toni, if you are on twitter they are worth following for all "The TomKat Studio Insider Info" @TKS_Andrea and @TKS_Toni), and I believe it won't be long until she will be featured to inspire you in a stylish magazine. Thank you Kim, for allowing me to share my incredible feelings of gratitude for what you do, and for being a tremendous inspiration to me. Enough chatter: go see the rest of the party! Incredible details! Cute down to the finest decoration. Thanks so much for sharing. I am a regular follower. Your featured articles are the best! I truly love reading your blog and updates. Keep the ideas coming! Love to mention your name & repost your blog link to my online children's boutique website blog. 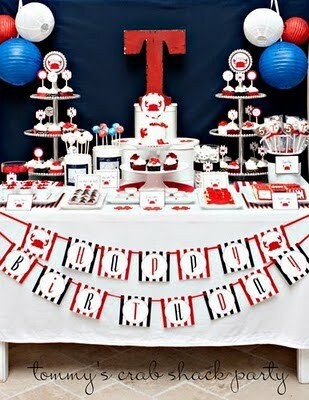 Keep the awesome party ideas coming! Oh goodness gracious..everything is gorgeous. She did a great job! adorable! 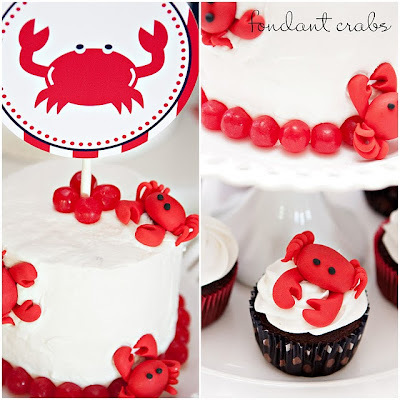 I love the fondant crabs! The blue background really makes everything pop! and that big T too! Thank you for such a lovely feature! Kim is deserving of all the kudos- she is a wonderful person and a talented designer!